I am writing this up in case anyone else is dumb enough to try it, and you want to know basically how to do it right. The Mitsubishi M-F01 FM Tuner I got the other day had some burnt out bulbs, turned out 1 white bulb, and both green bulbs were out. I made the HUGE mistake of removing all the screws on the faceplate to get to the bulbs. HOWEVER! I did manage to get the bulbs replaced. I found that the old incandescent bulbs ran off of 9vdc and that they were all white bulbs with colored rubber covers, one bluish, and the other Green. The white light comes from the blue colored one and the green you can figure out yourself. When you remove the faceplate, the dial, and tuning knob fall out. Then the dial string unravels YAY! In reality the only thing you have to do is remove the 2 screws that hold the circuit board in the picture below circled in red. Then carefully move the circuit board out of the way. The LED's work on a wide range of voltages and it does not matter what polarity or if you have AC or DC. Being standard LED's they were also the same size as the old bulbs. The old bulbs were mounted on small circuit boards, three wires; blue, green, and Black. Blue for the white light, green for green light and black was ground. 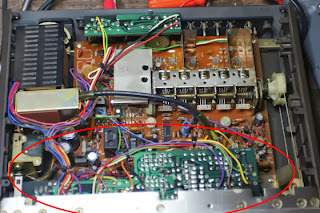 I removed the little circuit boards and I connected 1 wire from the white LED to the Blue wire, one wire of the Red LED (I chose Red instead of Green) to the green wire, and then the remaining wires from both to the black. I used shrink tube as needed. I installed the bulbs in the dial with hot glue after verifying that they worked. I did this for both sides (there are 2 sets of lights). I got it back together and restrung the dial. The only disadvantage to these LED's is that if you connect them to AC or unfiltered DC they may flicker juuuuuuuust on the edge of your perception. I did not take any other pictures because I was too irritated and did not think I was going to get it back together.